"Scientific research has proved that following a few simple prescriptions for the placement of lamps and fixtures will give you better light, protect your eyes from strain. "As with furniture arrangement, the 'rule' for placing lamps is comfort. The effort of figuring out a few simple measurements before you buy your lamps or place them will pay off in years of relaxation." According to Better Homes, the exact distance and placement of your task light depends upon the task and type of lamp. And they've made it incredibly easy for us by mapping it all out. So get out your tape measure, if you feel so inclined. Or just play I Spy, if that better suits you. I spy two mid-century kitties. And you? "The height to the lower edge of the shade should be between 47 and 49 inches. 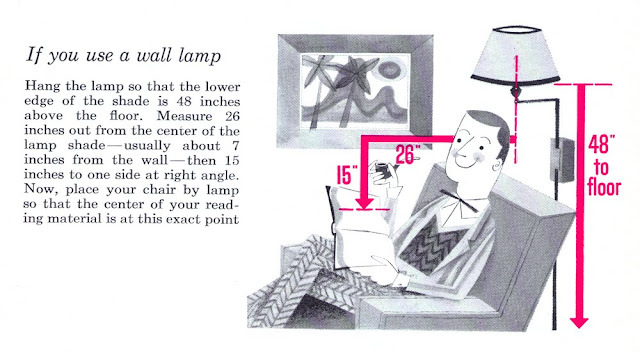 Measure 15 inches to one side from the center of your reading material, 26 inches straight back to rear. Place the lamp so shade center is above this point." "Table plus lamp base should total 39 to 42 inches. Measure 20 inches to one side from the center of your reading material. From here, measure 16 inches toward rear of chair. 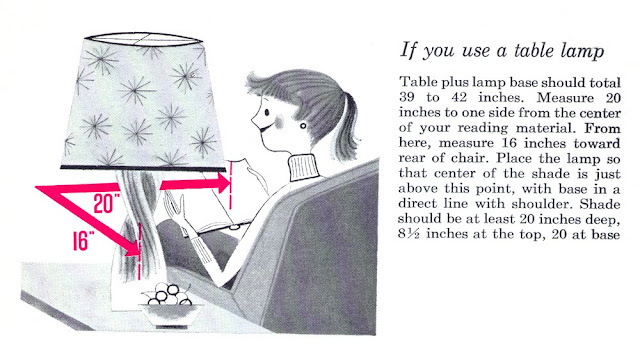 Place the lamp so that center of the shade is just above this point, with base in a direct line with shoulder. Shade should be at least 20 inches deep, 8 1/2 inches at the top, 20 at base." 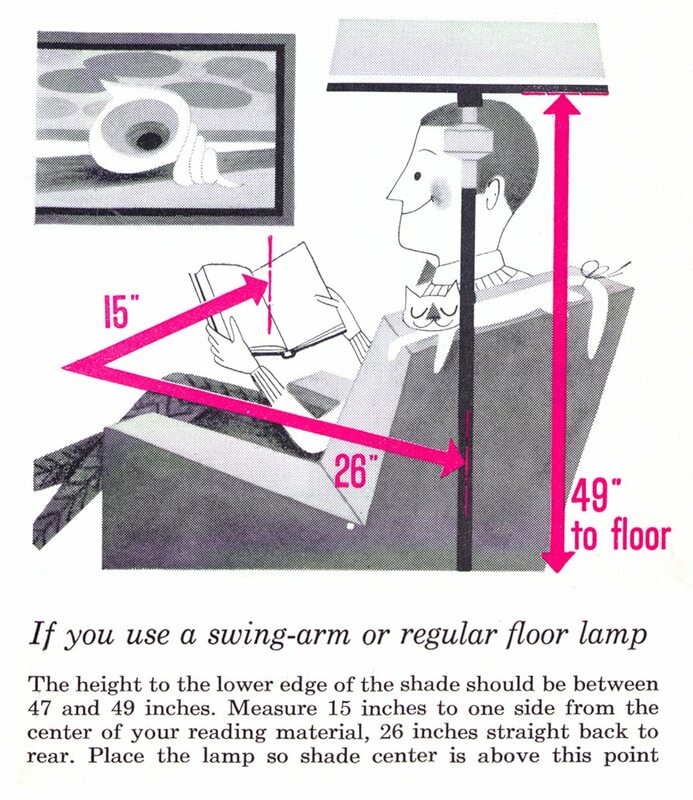 "Hang the lamp so that the lower edge of the shade is 48 inches above the floor. Measure 26 inches out from the center of the lamp shade--usually about 7 inches from the wall--then 15 inches to one side at right angle. Now, place your chair by lamp so that the center of your reading material is at this exact point." 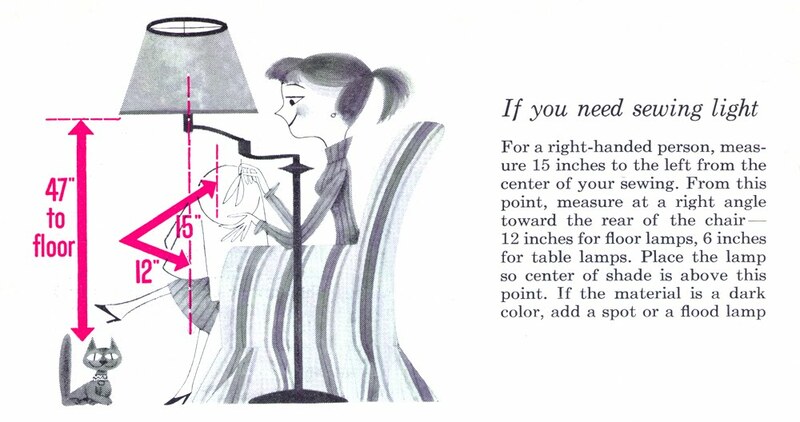 "For a right-handed person, measure 15 inches to the left from the center of your sewing. From this point, measure at a right angle toward the rear of the chair--12 inches for floor lamps, 6 inches for table lamps. Place the lamp so center of shade is above this point. If the material is a dark color, add a spot or a flood lamp."